CHINA wants to speed construction of a national network to charge electric cars to help reach an ambitious goal of five million green vehicles on its roads by 2020, Xinhua news agency (新華) said, citing a senior energy official. A shortage of charging facilities has long been a roadblock for sales by electric car makers from domestic firm BYD (比亞迪) to US rival Tesla Motors (特斯拉汽車), as well as for government plans to rein in high levels of pollution. China has made some progress on car charging infrastructure but its approach has lacked coordination, National Energy Administration (國家能源局) deputy head Zheng Zhajie (鄭柵潔) told Xinhua. 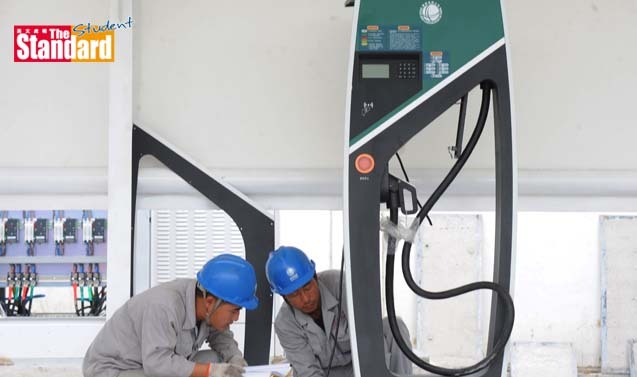 China aims to equip at least one in 10 public car park facilities for electric car charging, Zhung said, adding that the powerful State Council (國務院) would soon issue guidance for the infrastructure roll-out. Sales of green cars this year have almost quadrupled from the 2014 figure. The government sees electric cars as China’s best shot at closing a competitive gap with global rivals who have a 100- year head start in traditional combustion engines. China has rolled out aggressive targets for vehicle fuel efficiency that will grow gradually stricter until 2020, when its standards will exceed those of the United States and roughly match Japan’s. The government has also offered tax cuts for green vehicles and proposed extending subsidies, mostly for domestic producers, to help automakers meet these targets.